Whither The Astronauts Without A Shuttle? NASA is retiring its fleet of shuttle spacecraft to build something that can take humans past the moon and into deep space. That's expected to take years, leaving astronauts with some hard choices about what to do in the meantime. The Space Shuttle Discovery on its final mission to the International Space Station in March 2011. 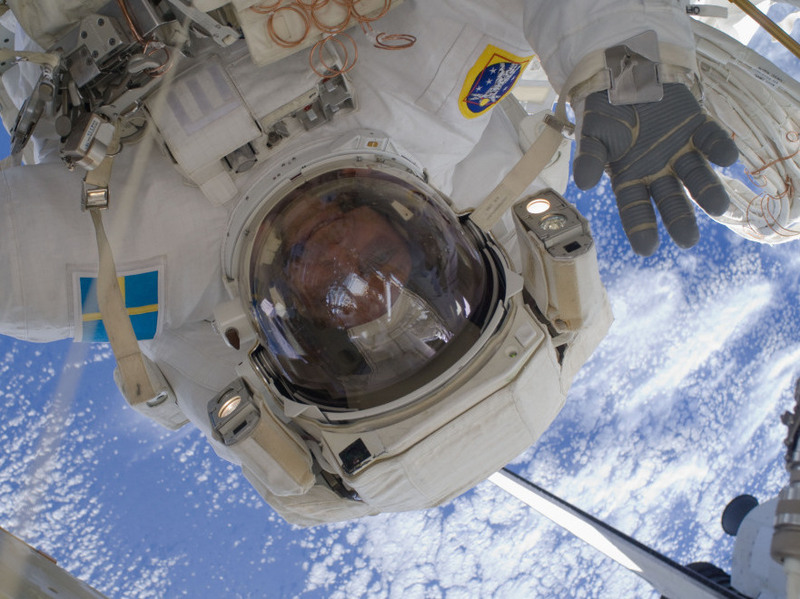 Mission Specialist Christer Fuglesang waves on a spacewalk during a 2009 shuttle visit to the International Space Station. On July 8, the final space shuttle will take off from Cape Canaveral in Florida. 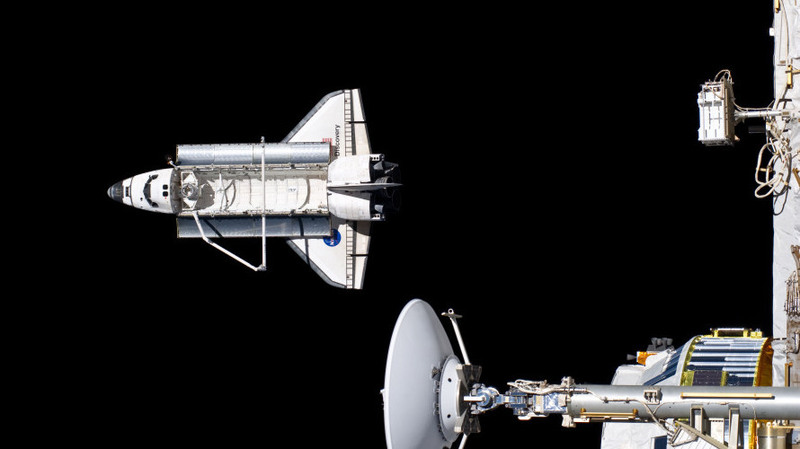 With it comes the end of a 40-year program that's put more humans in space than any other. NASA is retiring its fleet of shuttle spacecraft to build something that can take humans past the moon and into deep space. That's expected to take years, leaving astronauts with some hard choices about what to do in the meantime. Brave, daring and working for the greater good, astronauts rank up there with firemen and the president for jobs that inspire kids and spawn scores of movie scripts. Most of us don't make it past the credits before we've abandoned our own dreams of space travel. Most of us, but not all. Not astronaut Jose Hernandez. "I remember we used to have an old black-and-white console TV, and we would watch the moon walk," Hernandez says. "I would sit there and I would go outside, look at the moon, come back in, watch Gene Cernan walking on the moon, go back out — and I was just amazed that we had humans up on the moon a quarter-million miles away." Hernandez grew up in a family of migrant workers from Mexico, picking everything from strawberries to lettuce. But ever since he saw those Apollo missions as a kid, he wanted to be an astronaut, and he spent most of his adult life earning engineering degrees, learning Russian, whatever he could to get on NASA's radar. It took him 12 tries to get into the astronaut program, but by 2009 he was on a shuttle to the space station. "You go up, and you taste it once, and you want to go back, absolutely," he says. "The day after I got back, I wanted to go back. It's almost addicting." That same year, President Obama delivered a budget to Congress calling for the end of the shuttle program. The plan is for NASA to develop a new spaceship, powerful enough to get to Mars. Meanwhile, the U.S. will still work on the International Space Station, but NASA will have to buy seats on Russian spacecraft to get people there. 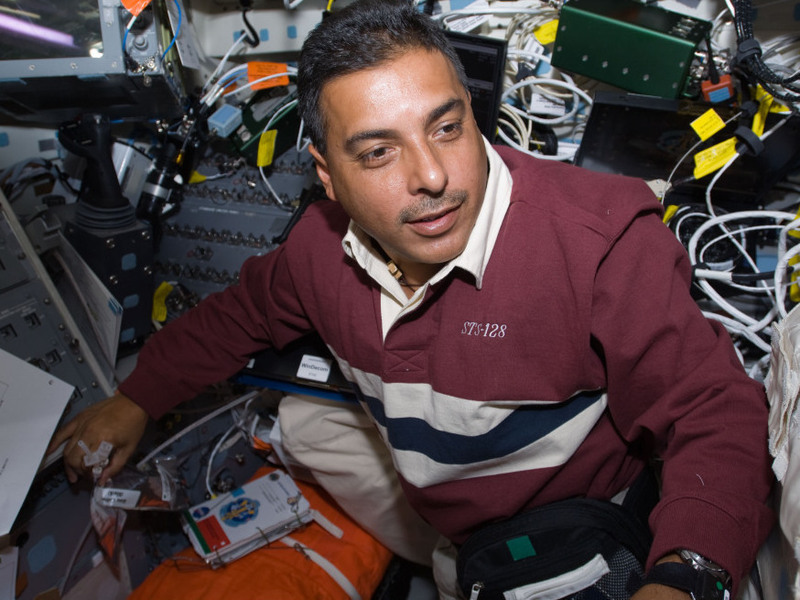 Astronaut Jose Hernandez flew aboard the Space Shuttle Discovery in 2009. 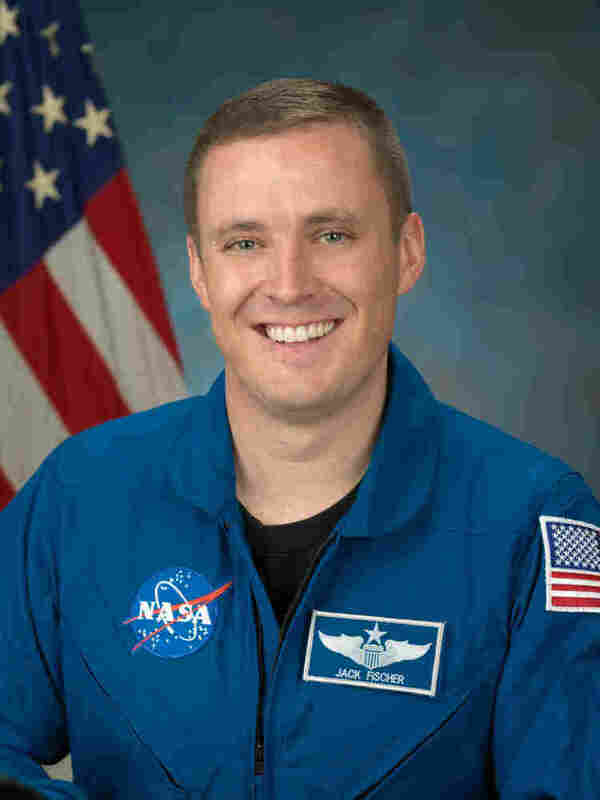 He chose to leave NASA as the space shuttle program came to a close. For Hernandez, the new job requirements were too much. He made the painful decision to leave NASA this past January. "When you train for a shuttle launch, 95 percent of the training is here at Johnson Space Center, so you come home every day," he says. "The International Space Station, it's more like a 2 1/2-year training flow. And 80 percent of those 2 1/2 years, you're training abroad. Then you come back, and then you're gone for six months, consecutive, because it's a six-month assignment. It's not a two-week assignment like a shuttle assignment. So I started doing the math, and I said, you know, I really want to enjoy my kids as they grow up." That's five kids — and years to go before NASA builds a replacement spaceship. Hernandez retired his helmet and headed to the private sector to work as an aerospace contractor. Last year, 20 active duty astronauts left NASA. Now the Houston facility, where there used to be more than 100 astronauts in training, has only 61. Mission specialist Mike Barratt is compact and broad-shouldered. He's pumping iron — actually, vacuum canisters that substitute for the weights that would be useless in space. "I flew 6 1/2 months in 2009, and I used this machine during that time," he says. The ARED, or Advanced Resistive Exercise Device, sports adjustable arms and various bars standing over a yellow platform. "There is one of these in the space station." Without strength training, astronauts lose bone and muscle mass because their bodies aren't fighting gravity. That means they are required to work out — time Barratt actually looks forward to when he's on a mission. "Nobody can get you during this time," he says with a laugh. "You're off the timeline, they know not to call you during your exercise time, you're not thinking about your mission and the work that you have to do — so psychologically it is the only true downtime you have during the day." Barratt got a late start as an astronaut. He celebrated his 50th birthday in space two years ago on his first shuttle flight. Mission Specialist Michael Barratt prepares his fellow astronauts for a spacewalk in the airlock of the International Space Station in February 2011. Now that astronauts are focused on working at the International Space Station, that means longer missions. But it also means less of a chance to fly. There are fewer trips a year. They require half the number of people — and double the training. It also means more study time abroad learning Russian, and enough engineering under your belt to fix everything from robots to toilets. Barratt's plans? Stick with NASA and his studies in space medicine, and develop training for the next generation of astronauts. "It's the end of an era. 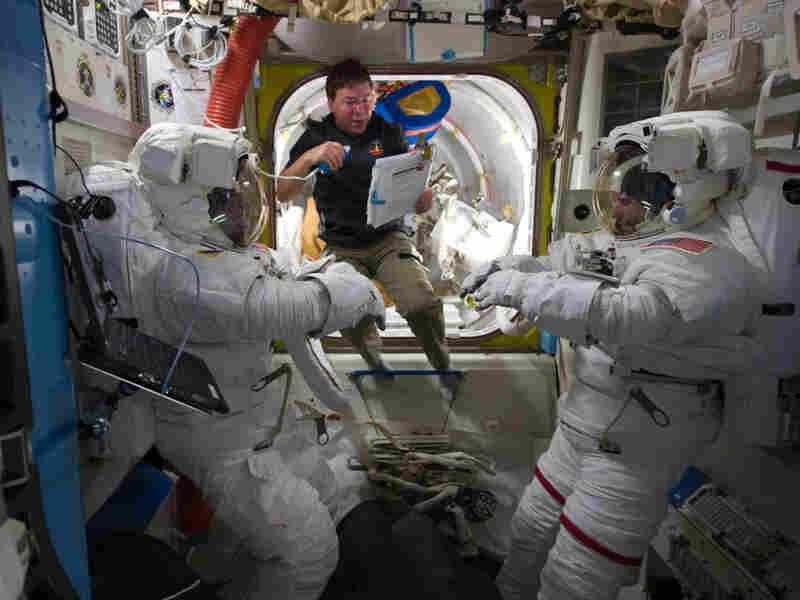 It's not the end of human space flight or the end of exploration as we know it," he says. "So you're stopping [the] shuttle, but you're starting the complete assembly of this magnificent space station. "There's obviously a hiccup in what our next generation crew carrier would be and everybody kind of worries about that, but in the grand scheme of things, that is just a hiccup," he says. "We'll solve it; we'll figure out something. Maybe four years are going to go by with no U.S. capability to get people up there, so something will come about and this'll be kind of an unhappy memory." On the other side of the Johnson Space Center campus, the incoming class of new recruits is plowing on as well. Jack "Two Fish" Fischer, for instance, is practicing his space walk. It took six men to help him into the 300-pound astronaut suit, and a half-dozen scuba divers to keep an eye on things underwater. It takes a crane to lift and lower him into the neutral buoyancy pool, which has a mock-up of a portion of the International Space Station. His classmates pose as Mission Control, tossing out various commands to Fischer and another trainee, plus the occasional curveball to make sure they can walk, move and think on the fly when they get to space. Many astronauts these days are scientists. With his square jaw, crew cut and clear blue eyes, Fischer is almost a throwback. He's a fighter pilot from the Air Force, where he got his nickname. "It's unfortunate — everybody wants to have a cool nickname like 'Maverick' or 'Goose,' but when I went to my first operational squadron, there was already a Fischer there and he was kind of a portly fellow, so they called him 'Blow Fish.' And so one fish, two fish," Fischer says. "It could be worse." The name stuck at NASA, where Two Fish beat the odds and thousands of other applicants to get into the space program. "Every step, you have to love what you're doing," he says. "If that's what you do for the rest of your life, then so be it. And I followed that. And I loved what I did. I loved being a fighter pilot. I loved being a test pilot. Nowhere would it have been a bad thing if I didn't make it. But it's certainly a good thing that I was lucky enough to get here." He's one of just nine people in this astronaut class, the first to sign on knowing they'd never get to fly a U.S. space shuttle. Fischer insists it's still worth it. "In the early '70s when the [new recruit] classes were chosen, the Apollo program was being canceled. The last three flights didn't even go." It was quite a wait for the next space vehicle, he says, which was the shuttle. "It wasn't until '81 that it actually flew." "Every next big evolutionary step in our exploration program, there is going to be a pause," Fischer says. "I think all of us are willing — and more than willing — to wait as long as it takes. So maybe we wouldn't fly, but if we can add our talents to helping make that next step, then by golly, it's worth it." After more than two years of training, Fischer is nearly done with all of his exams. Soon, he'll be ready for his first assignment, even if it's years away.